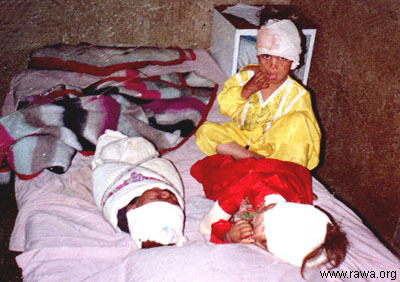 These 3 children were photographed by RAWA reporter in Sahat-e-Ama Hospital (Public Health Hospital) in Jalalabad. They have lost their parents in the US bombardment of Karam village of Surkhrod district in Nangarhar province (south of Afghanistan) on October 11, 2001. Taliban and Arabs had their center in this village but they all had already left the village when the US war planes repeatedly bombed this village. Dozens of civilians were killed and wounded in this bloody incident.